The gifts we receive represent our single most important source of community support. Since 1966, Androscoggin Home Healthcare and Hospice has been dedicated to enhancing quality of life for every member of our community – never turning anyone away. We are proud to provide innovative and compassionate medical care regardless of mobility, economic, or medical limitation. Each year, more than 10,000 individuals and their families turn to us for expert medical care provided in the comfort of home – whether to manage a chronic condition, health after surgery, illness or injury, or for end-of-life hospice care. Your gift helps us to fulfill our mission of enhancing quality of life by providing innovative and compassionate care for all. We are incredibly grateful for the generosity of our Annual Giving donors – the individuals and families, businesses and foundations who share in our purpose to provide expert health, hospice, and care management services within the comfort of home. A gift to our annual fund ensures patients who are unable to pay receive the care they need. This continued commitment is truly a measure of your goodwill and high regard for our organization and the people we serve. As always, those who turn to us for care are the beneficiaries of your generosity of spirit and commitment to Androscoggin Home Healthcare and Hospice. Gifts of Remembrance are made in honor of loved ones who have passed. Gifts can be designated to certain services within our organization, for example: Hospice House. These gifts can be made in conjunction with funeral arrangements or in recognition of the outstanding service a loved one received from Androscoggin. We would be happy to provide you with Gifts of Remembrance envelopes for family and friends. Contact the Development Office at 207.795.9404 or email us. A recurring gift is a monthly, ongoing, specific gift amount determined by a donor that is charged to a donor’s credit card. How do I sign up for a recurring gift? You may sign up by filling out the Recurring Gift donation form or you can call the Development Office at 207.795.9404 or email us. Donations continue until the end date specified by the donor or the donor requests they stop. What are the benefits of a recurring gift? Spreading your support throughout the year will help with personal budgeting without having to remember deadlines or tax season donations. It is cost-effective, convenient, and flexible. You may change your monthly donation anytime to fit your budget. Is this type of gift tax deductible? How do I get a receipt? Yes, the donation is tax deductible. A tax receipt will be mailed to you in January of the following year. 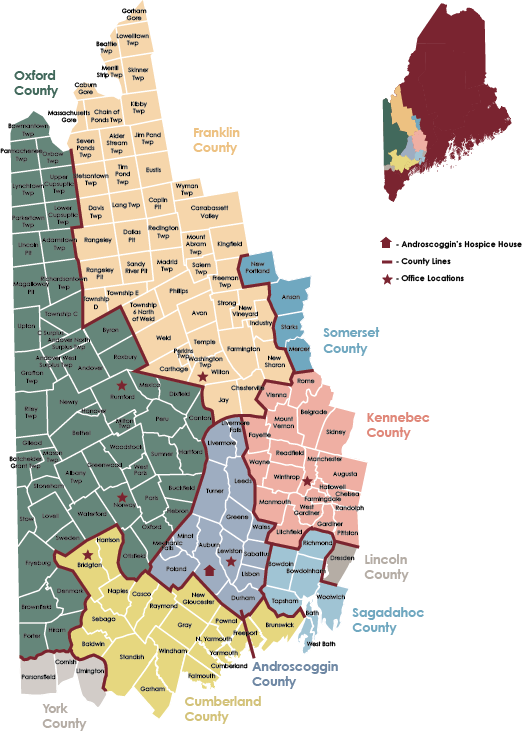 Androscoggin Home Healthcare and Hospice is a 501 (c)-(3) nonprofit organization. Your contribution is tax-deductible to the extent allowed by law.